· The Final Note: John and Gail – Everyone’s favorite Talk-a-pella podcasters are back, combining their resources to produce an exclusive d’aca’mentary following the beloved classic Bellas. We discuss their far-fetched endeavor with the cast and filmmakers to better understand our favorite aca-duo. 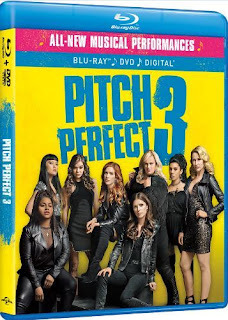 · Just Because He’s a Bad Guy – The cast and filmmakers were overjoyed to learn that legendary actor, John Lithgow was joining the Pitch Perfect family, and he did not disappoint! In this piece, we’ll witness how Rebel and John are two peas in a pod, making their on-screen chemistry as father and daughter truly sincere. · A Cappella Action – In this piece, we break down the scene starting with Fergus betraying Fat Amy and kidnapping the Bellas, through the performance and wrapping up with Rebel Wilson as she performs the stunt of falling through the ceiling. · The Women of Pitch Perfect 3 – With Elizabeth Banks, Trish Sie, and an all-female cast, the Pitch Perfect franchise is breaking down stereotypes and industry norms left and right. In this piece, we learn why that’s so important throughout the development and production of Pitch Perfect 3. · The Final Performance – In this heart-warming piece, fans will witness the genuine love and sisterhood between the Bellas both on and off camera as they get a behind-the-scenes look at the emotional wrap of the film and production. · Hollywood of the South – Hollywood may be the “Entertainment Capital of the World” but Atlanta is a close second - morphing into a metropolis for film productions and the cast and crews couldn’t be happier. We hear from them about the hospitality, versatility and southern welcome they experienced during their stay. o Evermoist: "How a Heart Unbreaks"
o Young Sparrow / DJ Dragon Nutz: "You Got It"
o Saddle Up: "Ex's and Oh's"